Devotions for a Sacred Marriage explores how God can reveal Himself to you through your marriage and help you grow closer to Him as well as to your spouse. Fifty-two weekly devotions encourage couples to build a marriage around God's priorities. From learning to live with a fellow sinner, to the process of two becoming one, to sharing lives as brothers and sisters in Christ, Devotions for a Sacred Marriage will continue to challenge couples to embrace the profound and soul-stretching reality of Christian marriage. 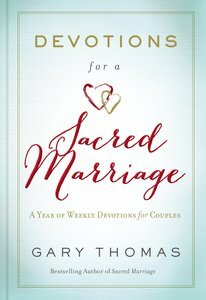 About "Devotions For a Sacred Marriage"